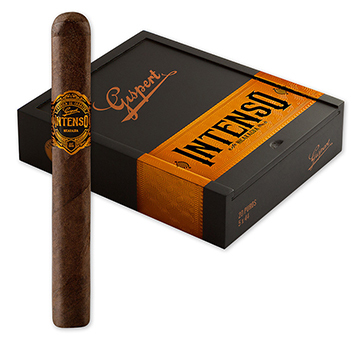 As its name and bold packaging imply, the Gispert Intenso is an intense, full-bodied cigar. Born from yet another successful collaboration between Altadis USA's Grupo de Maestro blending team and cigar-making phenom A.J. Fernandez, the box-pressed Gispert Intenso is handmade in Nicaragua at Tabacalera AJ Fernandez Cigars with Nicaraguan Criollo 98 and Dominican Piloto Cubano long-filler tobaccos bound in Nicaraguan Criollo 98, and covered in a luscious, oily Connecticut broadleaf wrapper. Gispert Intensos are earthy, creamy cigars with tons of flavor, including notes of dark chocolate, roasted coffee, baking spices, black pepper, and sweet fruit.